The Burundian government wants to leave the International Criminal Court. They’re well on their way. via Washington Is Unhappy That Burundi Is ‘Very Happy’ to Be Leaving the ICC — Foreign Policy. Also see my post on if certain African leaders are anticipating their own bad behavior by leaving the ICC. Leaders at the UN have announced their collective support of Portugal’s former Prime Minister, Antonio Guterres, as the new Secretary General starting next year. He will replace South Korea’s Ban Ki Moon for the first of two possible five-year terms. In a secret ballot, 13 Security Council members voted in support of him, two neutrally, and none voted against him. Although he is not the female SG many had hoped for, as there as has never been a woman to hold the position, it is still good news. So, why does this new SG matter so much to Africa? Guterres was the 10th High Commissioner for Refugees, and most of his UN experience has been working towards humanitarian efforts for those who are displaced. He has been a vocal supporter of greater Western intervention on behalf of refugees, particularly those from Syria. 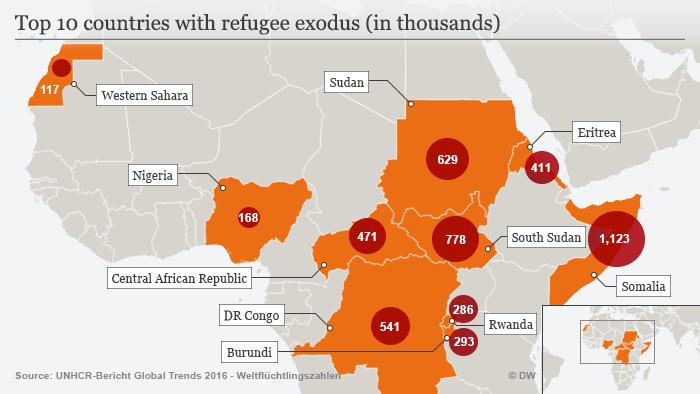 Although the world’s attention has been focused on those displaced from the Middle East, the refugee crisis has worsened in Africa too. The UNHCR reported that about 16 million people in Africa were either displaced or forced to flee to other countries. This figure increased by 1.5 million from 2014. Most of these people, about 10.7 million of them, were internally displaced persons (IDPs). The remaining 5.2 million were people that fled their home countries. The vast majority of these refugees, roughly 4.4 million, sought refuge in neighboring countries. Like the previous years, the ongoing civil war in Somalia remained a huge factor in the high number of refugees. The simmering conflicts in South Sudan and Sudan were also responsible for putting many people on the run. Burundi descended into chaos after President Pierre Nkurunziza announced he was running for a third term, an election he went on to win. In Nigeria, the Boko Haram crisis drove a higher number of refugees to neighboring countries. There are few who are better poised to understand the displacement challenges of Africans than Guterres. Appointing the former head of the UNHCR as SG is a sound decision, and good news for those concerned for refugees and IDPs from Africa. Let’s still focus on a female SG for the next round, though, as this gender imbalance continues to be pressing.